San Francisco Mayor Ed Lee passed away on December 12, 2017, after suffering from a heart attack on the night before. The suddenness of his passing has stunned many including in the Asian community. For many Asians and people of color, the late-Mayor represented a set of firsts. He was born and raised in the Beacon Hill neighborhood of Seattle, Washington. He came from a lower-income household and was the son of immigrants. His father, Gok Suey Lee, “fought in the Korean War, worked as a cook, and managed a restaurant in Seattle.” His mother worked as a seamstress. He grew up among five siblings. So even by yesterday’s standards his climb out of poverty had to be challenging and difficult, as most residents in this area would have and still recall. Nevertheless, he aced through his undergraduate years at Bowdoin College in Maine, and slogged through graduate school at Boalt Law School at U.C. Berkeley. Rather than seek lucrative law position with private corporations, Ed Lee instead went to work for the Asian Law Caucus. Back then the Asian Law Caucus was a small outfit primarily serving low-income Asian-Americans with issues revolving around immigration, citizenship, and civil rights. Asian Law Caucus was the first law center to organize and amalgamate with other fledgling Asian organizations around the country to rally people around the murder of Vincent Chin in Detroit in 1982 and the subsequent unjust trial. Helen Zia, then a journalist, was the activist who helped lead the fight around the nation. 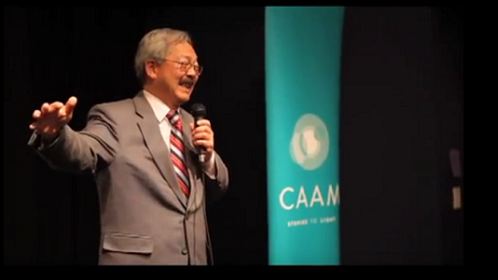 Ed Lee was a man with a heart. He could have done what so many ambitious young men do, which was use the ALC as a stepping stone to a lucrative high-powered career. Instead, he stayed with the ALC for ten years, learning intimately about progressive politics, and the people, names, and faces of who to touch base with in a rough-and-tumble town such as San Francisco, on how to best get things done. This was why even when he transitioned into City Government, it was still with the idealistic perspective, working in human rights, employment relations, as well as becoming a whistleblower ordinance investigator. Of course, to round things out, he also did a stint as public works director before being hired in City administration. The point was, he wasn’t just groomed as a career-track politician in the way younger politicians are today. He really believed in the grassroots. As Mayor, Lee tried to get many things done, even if there were too many special interests besetting or obstructing the city, and too often stirring up conflicting agendas and graft. +With the help of Chinatown activist Rose Pak, he helped open a new hospital near Chinatown. +Under his mayorship a record number of housing units were constructed which helped to revitalize urban corridors. +Lee helped raise the minimum wage and enact a new law in the State Legislature to keep raising minimum wage. +Based on observation and experience, many and extensive improvements in area-wide public transportation. (Here’s a great tribute posted at San Francisco Municiple Transportation Agency). Ed himself has an immigrant background. His mother was a seamstress. He understood what it was to live in public housing, and on top of that he was fluent in Cantonese. None of these residents really spoke much English. And so in order for a lawyer to effectively gain their trust and to work with them, being totally fluent and bilingual was essential. Over time, not easily done, he gained their trust. We are all shocked and deeply saddened to hear the news. We are proud to call Ed an alumnus. Perhaps the greatest testament of his character lies in those instances when Advancing Justice-Asian Law Caucus disagreed with city policy. Despite the disagreement, the Mayor’s support of ALC’s mission was unwavering. He will be missed, not only by his former colleagues, but all of us who had a chance to work with him as Mayor. After so many years of dedicated work for the public sector, Ed Lee could not have changed in the way people claim. He had to try to balance powerful development and gentrification interests which might have been like being forced to wear an albatross round one’s neck. Lee had to compromise with inchoate corrupt elements that could not be done away with. He also had to get used to all the habitual haters. This is why listening to his speech given at the event, Vincent Chin 30: Standing Up Then and Now, there are such memorable educational quotes. This speech serves as the hallmark of his aspirations. In it, Lee talks about collaborating with groups across class and racial lines. He instructs the audience on building tolerance for religious groups such as Muslims. He proclaims his desire for the continued success of ALC and CAA. He touts his values for freedom, housing, and economic opportunity for all people, whatever their background. Unless you unleash the talent that is within our diversities, you can’t get the best minds, the best ideas that result from freedom. Lee also recognized that the same divisive reactionary elements that are at work in Congress were at work in the Bay Area, people who don’t believe in sharing the American Dream, while bullying and blaming poor colored people for their failures. That’s why we have to continue to work with DAs to work to break down and stop bullying and stop divisions, and where people use the law, and people hide behind the law. I like to believe that the Mayor was true to his philosophy, or as true as he could be till the very end. That he really believed in trying to represent everyone, all races, all ethnicity, including gender orientation. I very much recall the very strong passionate feelings we had when we [including Helen Zia] had a chance to meet Mrs. Chin and had a chance to talk about the hopes and dreams that Vincent had in Detroit. And they are no different than all of our kids. Fine words, from a noble person at heart…and a Seattle native son made good. 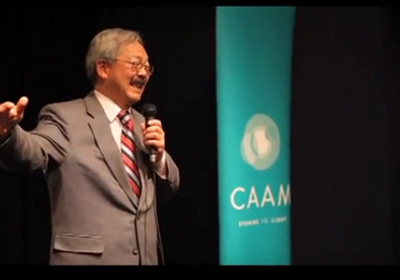 Vincent Chin 30: Introduction by Mayor of San Francisco Ed Lee, a leader of the “Justice for Vincent Chin” campaign. Hosted by CAAM and APAforProgress on June 23, 2012. Image from Vincent Chin 30 hosted by Center for Asian American Media (CAAM) and Asian Pacific Americans for Progress (APAforProgress). *Since the Office of Mayor is now transitioning the About the Mayor page will be saved as archived text here.